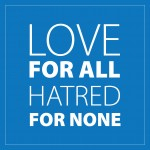 The Ahmadiyya Muslim Community unequivocally condemns the recent attacks on a bus in Karachi, Pakistan, where it is reported that over forty innocent people from the Ismaili community have been killed. Our thoughts and prayers are with the victims of this heinous crime. We offer our heartfelt sympathies and condolences to all those who have been affected and the Ahmadiyya Muslim Community stands ready to help those in need.